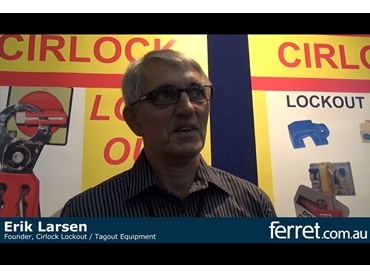 Cirlock Founder Erik Larsen speaks with Ferret.com.au about the history of his company before introducing a new range of safety lockout padlocks in this video filmed live at the Sydney Safety Show 2012. An Australian owned and family operated business, Cirlock specialises in lockout and tagout equipment for energy sources. It was founded in 1992 and has since steadily grown and expanded to offer a complete range of lockout equipment. The company's aim is to provide a full range of lockout equipment for energy sources in all industries. Almost all products available from Cirlock are designed and manufactured by the company or on its behalf in Australia. The new range of safety lockout padlocks Erik introduces in the video were designed specifically for use in the mining industry, but are ideal for a wide variety of industrial lockout applications. They are available in a choice of yellow, red, orange, green or blue and can be supplied with individual keys for each lock, or in a set keyed alike.